The intention of this project was to position the Barramundi industry to begin a genetically and economically sustainable genetic improvement program that will provide large economic benefits in the future. 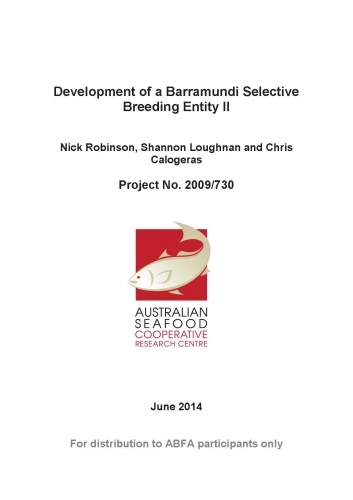 This project has set the foundations for creating continuous improvement of the efficiency of production by the Barramundi industry in Australia through the creation of an entity for the selective breeding and distribution of genetically improved fish. Significant progress has been made towards the establishment of the selective breeding program for Barramundi. A database of potential broodfish for establishing the selective breeding program and their genetic relationships has been established and analysed, and this has revealed where common ancestors exist and will also reveal any significant gaps in representation where additional fish from targeted wild populations may be needed. The proof-of-concept trial spawning showed that the genetic plan is a practical way forward. Genetic diversity within existing captive broodstock has been investigated and compared to wild populations around the Australian coast. A simulation model was developed and used to determine the most appropriate broodstock candidates to use when establishing a base population for barramundi selective breeding.